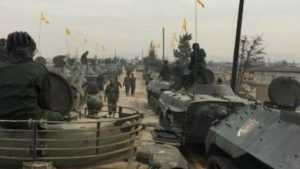 Hizbullah fighters in Syria are using American armored personnel carriers originally supplied by the U.S. to the Lebanese army, a senior Israeli military officer said. In an intelligence briefing to foreign reporters in Tel Aviv on Dec. 21, the senior officer showed a photograph of Iran-backed Hizbullah military vehicles, which he said included U.S.-made armored personnel carriers (APCs). “These APCs are of the Hizbullah, while fighting in Syria, that they took from the Lebanese armed forces,” he said. The U.S. State Department said last month that the American embassy in Beirut was working to investigate images posted on social media sites that purportedly showed Hizbullah, which supports President Bashar Assad, displaying U.S. military equipment in Syria. Those images were widely reported to have been of U.S.-made M113 armored personnel carriers, which the State Department said were common in the region. The Israeli officer said Hizbullah has 8,000 fighters in Syria where more than 1,700 of the Iran-backed group’s combatants have been killed since 2011.